Wooden decks and porches if not properly cared for can be an all day breakfast, lunch and dinner buffet. Termites, the most destructive insect of wooden structures are opportunist with an unending appetite . They are masters of taking advantage of a neglected home. So how can home owners keep their outside recreational areas free from termite infestation? Well, there are three key ways. First, it's important to give a visual inspection of all accessible components of your deck and/or porch. The illustration above gives the names and shows the areas of the components you should inspect. The posts, beams, joist and face-boards are the areas you want to especially examine because they are closest to the ground where subterranean termites emerge from. In these areas look for mud-tubes that termites construct to travel back and forth from their nest in the ground to the wooden members. Have with you an instrument with a pointed edge, like a knife, screwdriver, or ice pick. Gently but firmly probe areas of the wood. If the instrument goes through, likely there's termite damage. If you see a lot of cream colored insects, about 1/8 to 3/8's of an inch in length you have termites. Check for loose rails, steps and balusters as well as columns. Probe them too because the outside of the wood may look fine, but could be hollow inside. If the wood is sound, then tighten them with nails, screws or bolts. Check the decking for damage such as splinting and loose deck boards. Walk across the deck to determine if any areas are weak or sinking. 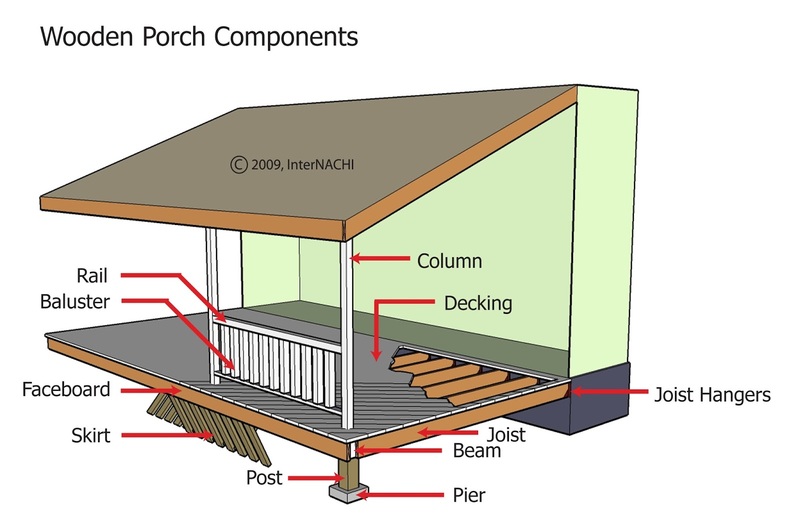 If possible check underneath the deck or porch, especially the undersides of all joist, beams and decking. Second, make sure that you have good drainage. If you don't have a deck or porch cover make sure the deck boards are spaced so that rain water will not accumulate on the deck. The grounds around the house should be sloped so that water drains away from the house, not towards it. Post should be mounted on piers, not in the dirt or ground. Wooden steps should rest not on dirt, but upon a concrete base or apron that extends at least 6 inches above grade. Paint or stain all wooden members, including the undersides and cut edges. Finally remove any wood debris from under and around the house and deck. Scrape wood, tree stumps, mulch, boxes and branches all attract termites to your home. A visual inspection is the beginning of protecting your home from termite infestation. If you think you have a termite infestation on your porch or deck, call a pest control professional for an inspection and treatment options.